One&Only Cape Town: When it launched, the who’s who was invoked, expenses weren’t spared, champagne flowed. The party hasn’t stopped, the champagne still flows, everyone who’s anyone in the city continues to see and be seen at the glitziest waterfront address. O&O flaunted modernity and vitality, established itself emphatically as precisely what it is- the One & Only! O&O’s Marina Rise rooms are palatial and boast walk-in wardrobes bigger than a London apartment. Mattresses so right royally rich that no princess, however pernickety, could feel a pea ensconced under it. Princesses will adore One&Only’s island spa, a city spa on a private island! Ask for Ntombi, who does fantastic ESPA facials. You’ve got fancy French Bastien Gonzalez mani/pedi too. 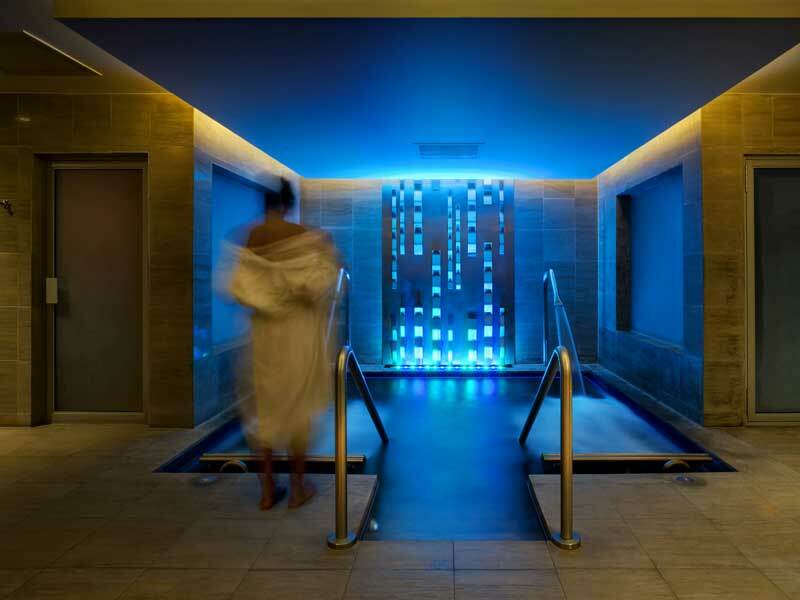 Or immerse yourself in the two-hour Essence of the Earth & Ocean ritual incorporating local sea salts and seaweed wraps customised by ESPA, exclusively for this spa. One&Only’s exclusivities include famous Japanese restaurant Nobu, where wasabi ice cream pairs with the best South African dessert wine from the city’s best selection. Wine galas are conducted by sommelier Luovo, who is only 28 but is mature like a fine old wine. He’s internationally-known, won South Africa’s Best Sommelier award in 2008 and hasn’t stopped winning since. Staff distinguish themselves with wit, vim and warmth — not altogether usual in Cape Town, sometimes so brutally businesslike. Nowhere else would staff wrap into little bon-bons breakfast cereal bars you’ve especially liked. This was for me to take along when I was when departing for Franchoek, where I was sent in a Mercedes Benz limo (only standard at O&O). One&Only also has the savviest concierge, who can get you into restaurants with apparently eternal waiting lists like Test Kitchen, whose PR declared it the “best restaurant in Africa.” It rather wows the uninitiated by an overwhelming assemblage of disparate items not necessarily consonant, and a painfully long sampling aggravated by monotony. If you’re vegetarian, you’d find beetroot on half your menu and celeriac on the other half. But try 95 Keerom, where internationally-renowned Milanese chef Giogio Nava makes pasta, awarded the world’s best. His ravioli won’t disappoint, nor will this disarming chef with a subtle sense of humour. Delaire Graff Lodge & Spa: The man behind Graff diamonds couldn’t get enough of the sparkles, and so deployed his expertise at fashioning sparkling diamonds to making sparkling wines. 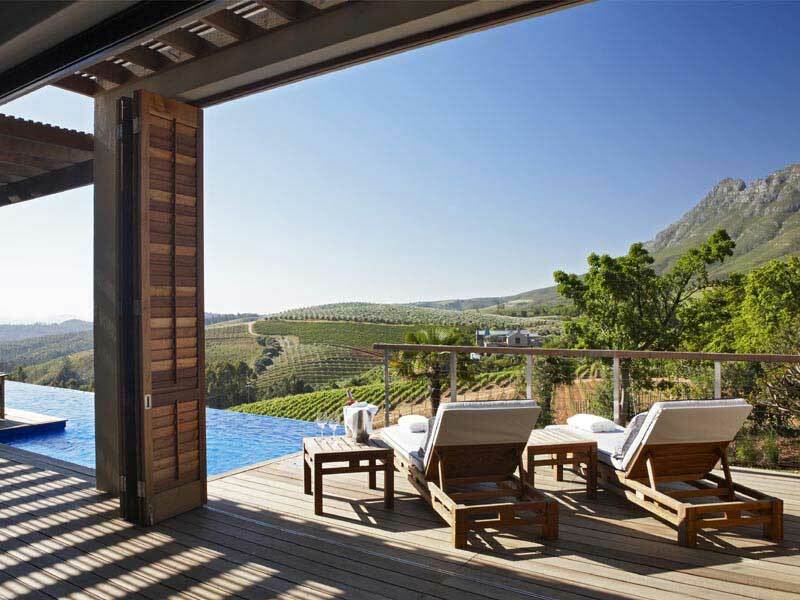 Delaire Graff lodges on exuberant vineyards. Say “I do” at the lodge and Mr. Graff can fix you a sparkling rock to land on that finger. Then honeymoon in villas with expansive vineyard views, especially entrancing when the setting sun evokes a ruby necklace strewn across a town whose sparkling lights look like a thousand glinting diamonds. Your villa with chaste white marbled bathrooms and white interiors might be elegantly sober, but its fine wines ensure a heady-nistic sojourn. Ask the lodge to send you to lunch at Haute Cabrière, that turns home-grown produce into delicate creations. The vineyard’s owned by eccentric German aristocrats whose wine cellar is an art gallery. For a taste of artisanal art, the lodge organises visits to 22-year-old Janine Van Zyl, whose home-made ice creams are quite a rage. Take along some wines from Delaire Graff’s collection, and Janine can transform them into adventurous Cold Gold (her boutique’s name). Delaire Graff can arrange visits to museums and art galleries, but the lodge itself is a live-in art gallery: artworks hand-picked by Mr. Graff are precious like his diamonds. Besides, this lodge alone boasts two culinary gems: Indochine serves contemporised Pan-Asian cuisine, under ceilings swirling with superbly crafted metallic birds, whilst Delaire Graff Restaurant offers views over swirls of vineyards. After lunch, Madame may doggy-bag a diamond or few at Africa’s only Graff diamond boutique, whilst Monsieur watches hours wither on those new Graff watches. He and his bank balance are rescued by her appointment for an Aromatherapy facial at the spa. La Residence (Franchoek): Throw in an Italian villa, Marie-Antoinette’s favourite toys and a heck of a lot of lavish tissues, chandeliers, marble, artwork, period furniture and an all-inclusive mini-bar, and this is what you’ll get; an enchantment of the senses, Liz Biden’s pet creation is sumptuous, overwhelmingly so. Individually designed suites have themes as varied as Tibetan, deeply orange and exotic, to French and fine Huguenot. Armani didn’t quite stay in the Armani suite, but Robert Redford did. However, Elton John naturally has a preference for the Queen of all suites, the Indian Maharani Suite. 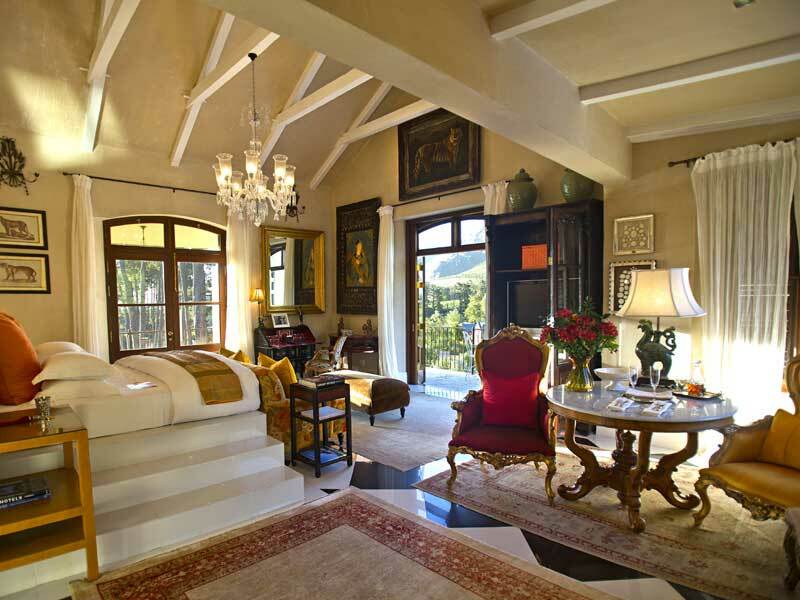 All suites have astonishing views, some over vineyards, all over luxurious lawns climbing into hilled verdure. La Residence lives in the French quarter, whose many dining options include new Foliage just down the road. But feed the senses over lunches on the hotel’s terraces, set on emerald lawns where sapphire peacocks strut — wonder whence this Indian exotica came. Perhaps some Indian Maharaja forgot his pets on holiday. Liz Biden didn’t return them, for they clearly enhance her hotel. Suppers are under stunning chandeliers and paired with wines from the estate. There’s a tasting menu too, that can be cancelled as per the GM’s whims — he can be quite a drama queen, befittingly amid this dramatic decor. Don’t irk the General Manager before your massage with masseuse Athena, who does the best massages in these parts. She’s so good that Robert Redford wanted to run away with her! 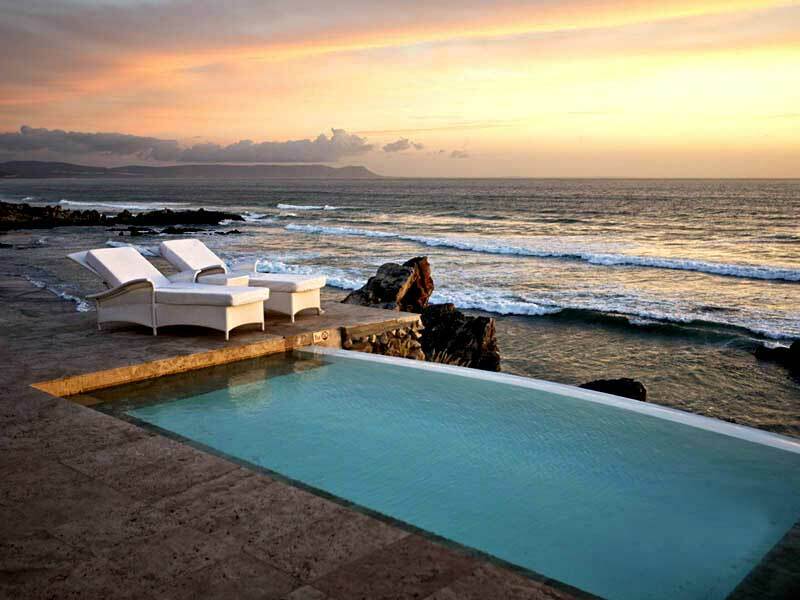 Birkenhead House (Hermanus): Corinne, the manageress, says Hermanus, a serene seaside town about 90 minutes from Cape Town, has “champagne air,” and is the only place in the world where you can breathe and drink champagne. You certainly can from the champagne-stocked, all-inclusive mini-bar at Birkenhead House, another Liz Biden creation. Set on rocks verging over the water, here’s the best address for whale-watching, from daybeds by the infinity-pool that seems to meld into the ocean. In ghastly weather, repair to a glass-encased salon, where you can stretch on massive white sofas by a fire place, warmly wrapped and copiously supplied with the best Earl Grey in South Africa, freshly brewed and served with the cake of the day. Cake is generously offered, and you keep gorging until you fear you’ll acquire a whale of a waistline. But Corinne says they have decided to curtail those leviathan South African portions, and are considering healthier cuisine, served in an all-glass dining room where you can keep whale-watching. There’s a spa for those whose whale-watching trips bad weather thwarts. I annul all expeditions, prepossessed as I am with my honeymoon suite, all red and ravishing and oriental, with sunken bath and outdoors pool. I refuse to leave it, much to the frustration of Corinne. Next morning over breakfast on the superb terraces –between multiple “Oh, there’s another whale!”– she tells me that they’d planned to fill my bath with roses, light candles, send champagne and chocolate-dipped strawberries. Then, I could experience their honeymoon suite in its entirety. I say for that they’d need to find me a man. “We can furnish that too,” Corinne smiles. “I’m very picky,” I sigh. “Try us,” Corinne is confident. Certainly, there seems little the lovely staff here wouldn’t oblige with! Mount Nelson (Cape Town): Cape Town airport isn’t the homeliest, but the Mount Nelson compensates with a classy airport pick-up, a Mercedes Benz and in it Zaheir, the most adorable chauffeur who provides an animated guide to Cape Town’s history, culture, architecture. His enthusiasm for Cape Town is unassailable. But then, we pass his home, sea-facing. “Yes,” he replies. He is one of the luckier ones, he adds. Soon he’s recalling the infamous “District 6”, and how blacks and coloured people like himself were extirpated from their homes when it captured white fancy to expropriate their land. Zaheir recalls the cruelties of apartheid, but without rancour. “Apartheid” is a taboo subject in South Africa. Just brush history under the carpet and wash one’s hands of the dirty truth. It’s good to finally hear the truth, even if it jars and mars the scenic route. Soon, too soon, for I’m enjoying Zaheir’s company and conversation, we reach the hotel. Historic, iconic, 115-years-old, the Mount Nelson is like an heirloom. A statue of Mahatma Gandhi greets you at the entrance, an air of grandeur escorts you through the corridors to a zingy bar, popular with locals. If the bar serves the Cape’s crispest home-roasted nuts, then Oasis Bistro offers at breakfast multifarious breads of European standard. I even asked if they had a French baker. 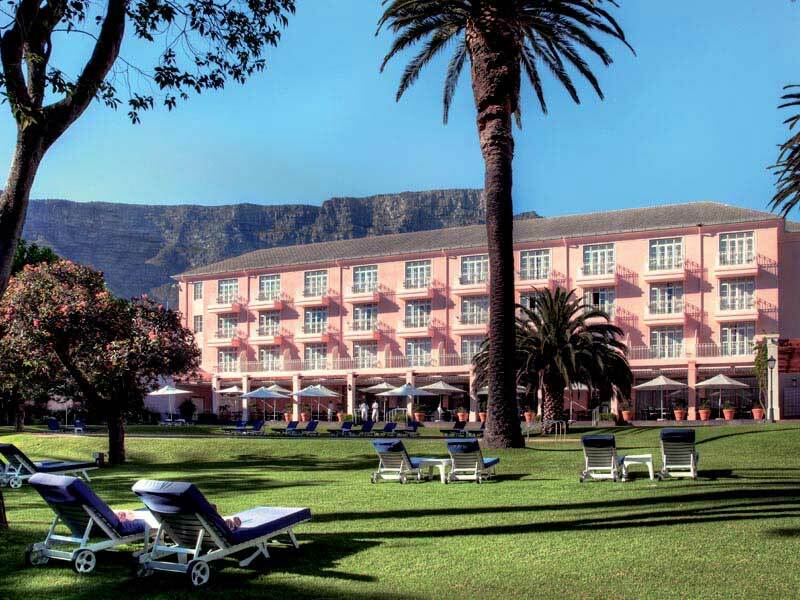 The Mount Nelson is Cape Town’s best-located hotel — I think, at least, invariably contrary to everyone else. Most hotels proclaim their trendy waterfront or glamorous sea-facing placements. But I enjoy museums and the Mount Nelson, in Cape Town’s historic heart, neighbours the gorgeous Company Gardens, with their wealth of museums, galleries and historic buildings, including the Parliament. The kilometre-long path traversing these gardens, doused in lush trees and carpeted with blooming lawns where birds flutter and squirrels mutter ends in the Slavery Lodge. Where you’re confronted with the truth in black and white, there’s no grey area of redemption. A few French tourists stay in here, nobody else does. A restaurant-owner had bewailed, “Cape Town’s so full of coloured people, you’d think you’re in Asia.” The Slavery Lodge enlightens that South Africa’s horrific slave trade also sourced slaves from India, Ceylon, Malaysia, Indonesia and China. The deplored superfluity of coloureds in the Cape are descendants of “imported” slaves. There’s a Jewish Museum, about which hotel staff say, “Wouldn’t interest anyone who isn’t Jewish.” The Jewish Museum also contains the devastating Holocaust Museum, and one would think that the Holocaust would or at least should interest any human being? This museum, that left me sobbing, also remains unfrequented. Museum officials, thrilled I hadn’t completed the museum in 3 hours, didn’t shut until I’d read every word in it! For those disinclined to museums, the hotel has an efficient and complementary shuttle service to Table Mountain, Camps Bay, the Waterfront and neighbourhood restaurants. The concierge, Byron, likes sending guests to Bistro Societi, where manager Johan delights, vodka-spiked pasta stuns (specify al dente!) and risotto’s the best in town. Butternut equals their celebrated mushroom risotto. And death-by-chocolate cake is to-die-for. 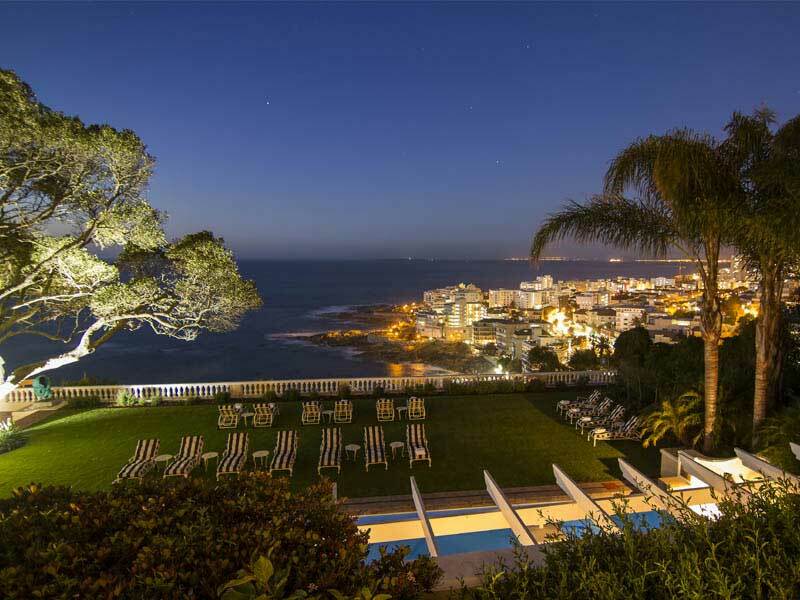 Ellerman House (Cape Town): It is a house, not a hotel, I’m informed. It’s certainly not a home, for one never feels quite at home at Cape Town’s most exclusive property (no walk-ins!). It is all wooded and wonderful. There’s ubiquitous artwork and views of seas and sweeping trees on manicured lawns. I’m amazed, and also cold. Perhaps guests here bring along their fur coats. My room, No 5, is massive, old-fashioned, very English. But the seascape from my terrace strikingly reminds I’m in Cape Town. Striking too is that the city’s priciest rooms haven’t fruit baskets or butler. There’s no concierge either. Perhaps one is expected to travel with one’s PA? Take along a packer too if your arm is bandaged like mine. (South African Airlines staff finally helped me pack at the airport). Ellerman House is one of those stiff, old-school establishments, “school” being the operative word. I didn’t quite grasp house rules, and felt like a schoolgirl, constantly ticked-off by headmistress-like management, it’s ironic how consistently it was impressed upon me that I was “enjoying” myself, nevertheless. Admittedly, I rather enjoyed spa therapist Louise’s power-packed massages. Its new wine gallery has artwork captures the spirit of the place, with pieces inspired by wine and brandy-making. Spectacularly in the centre of the gallery, temperature-controlled wine bottles wind round a crafted spiral, evoking a grapevine, a corkscrew or a vinously spinning head. I liked Chef Veronica’s supper in the elegant dining room. The pastry chef especially impressed. Breakfasts, chic and compact and with outstanding rye bread, are enjoyed over breathtaking views. My “enjoyment” impaired by the GM’s insistent remarks that I’d rocked up to breakfast ten minutes before breakfast closed. There’s apparently a complimentary shuttle service within a fifteen km radius, subject to availability. But it wasn’t ever available, complimentary airport drops being prioritised, it’s explained. But when I needed an airport drop, I found myself deposited at the airport five hrs before my flight, because the chauffeur had to get groceries (yes!) and then fetch someone from their gallivants. Intricacies of this shuttle service mystify. A comp airport transfer is guaranteed, but this could well be twenty-four hours before your flight.